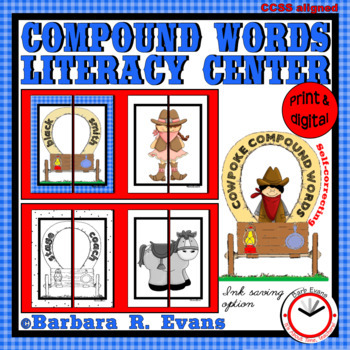 Hitch your wagon to this fun literacy center to give your cowpokes practice with compound words. 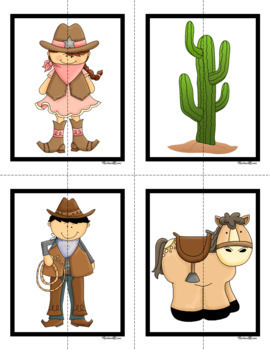 All of the words in COWPOKE COMPOUND WORDS pertain to the Wild West theme, giving your students additional experience with content vocabulary. The task at this center is to match covered wagon cards to make compound words. In consideration of your printing costs, the cards are provided in grayscale, as well as color. 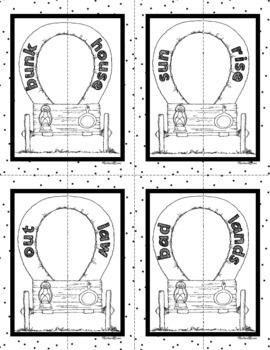 Make this center self-checking by printing the backs of the cards with the provided Wild West pictures. Once your students have finished making the compound word pairs, instruct them to flip each pair over. If the 2 halves make a picture, the match is correct. If 20 compound words are too many for the age and stage of your learners, simply put the appropriate number of cards at your literacy center. This product is CCSS aligned. 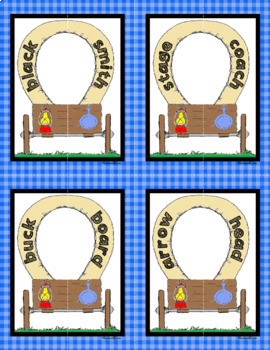 COWPOKE COMPOUND WORDS are part of the Wild West theme curricula collection in my store. ► Be the first to know about my new discounts, freebies, and product launches. All new products are 50% off for the first 48 hours. ❯❯ Click here to follow my store. You will now receive customized email updates about this store. ► Get TPT credit to use on future purchases. ❯❯ Please go to your My Purchases page (you may need to login). Beside each purchase you'll see a Provide Feedback button. Simply click it and you will be taken to a page where you can give a quick rating and leave a short comment for the product. Your feedback is important to me. Thank you in advance.